Being from Kansas City and living thirty minutes from Atchison, Kansas, I have visited Amelia's childhood home hoping for some kind of cosmic contact with her pioneering spirit. So I know the feeling. Since Amelia and Joni are both pioneers, Amelia in the air and Joni with music, the empathy of one pioneer for the other is a more obvious motivation for evoking this song. But as usual, there is subtler subtext in Joni's lyrics revealing other motivations as well. Six jet plans and vapor trails in the burning desert brings associations of "The Right Stuff" and the early days of aerospace at Edwards AFB not just the six strings of Joni's guitar. Of course, this Amelia lyric is also remincient of a Woodstock lyric, "And I dreamed I saw the bomber death planes riding shotgun in the sky." 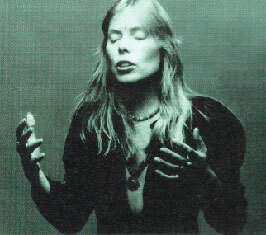 But in an earlier moment, Joni's lyric reflected a most hopeful outcome, "turning into butterflies above our nation" Here in Amelia there is not such transformation, or even hope for one, but just a reference to crashing. "He" is mentioned but not named. He doesn't have to be in our current world of ever more complex male-female relationships. Amelia and Joni both have "dreams to fly" and those dreams can make a "normal" relationship extremely complex. It isn't just 'a ghost of aviation" that got swallowed by the sky and sea. Pioneers often have expensive dues to pay for joining the club. Solitude has its rewards and can be seen even as a virtue but where does solitude stop and loneliness begin? The lofty heights of being a singular brave pioneer in the air or on the airwaves can turn into "icy altitude" causing ambivalence at times to even the bravest of hearts to ask themselves the question, "To fly or not to fly?" The need to fly while still having a passionate urge to merge can equal a Kierkegaardian leap of faith, a crashing into his arms. But alas, this is not a more traditional faith in a traditional man-woman relationship. Being anything but traditional, Joni's hope is more an existential leap of faith into his arms which is temporary at best and therefore, fated to be only "a false alarm". Technological and aviation progress occurs in the mention of 747s, but it is really progress? Since the dream is just a dream, it is still a false alarm. Whether the dream morphs into the form of the Wright Flyer, Amelia's doomed Lockheed Vega, or a 747, it is all imagery for post-modern woman's aspiration for both career significance and lasting love.